Properties in Te Arai average 4.6 out of 5 stars. Soak in the Tub, Enjoy the Ocean Views! Property 6: Soak in the Tub, Enjoy the Ocean Views! Property 22: Close to beaches, cafes and popular golf course. Property 33: Walk to the surf beach. Peaceful location. Fantastic estuary views. Property 41: Peaceful location. Fantastic estuary views. 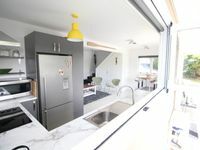 Kingfisher Cabin Mangawhai charming self contained private cabin with views..
Property 42: Kingfisher Cabin Mangawhai charming self contained private cabin with views..
Property 49: Beach House, Sleeps 6 - 8, 5min walk to beach. 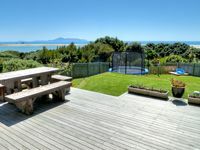 This property was perfect for our family trip, we had 9 people on our holiday and also booked the Mangawhai Chalets - there wasn't quite enough room for us all there so this property was ideal to take the extras and was only a short walk to the chalets and the shops. Lovely place to stay, thanks! It's like our home away from home. This is our 3rd time staying at this house and once again everyone thoroughly enjoyed it. We love the location, the view and everything about the house. It's just perfect for our big group! Thank you Lyn and Michael!